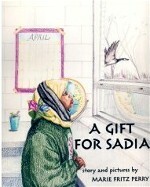 Sadia, a new immigrant to the US, befriends an injured Rochester Canada goose in this heartwarming story. Harley Fisher leans out the car window to feed geese Monday afternoon at Silver Lake. In spite of changes made to control geese at Silver Lake there are still numerous natural feeding grounds for the geese. Harley was the park with her mother, Anjanette, and her brother, Dash. Rochester and Canada geese are so synonymous that the city's baseball team and a local restaurant are named after them. Geese even grace the city seal. But there was a time, as recent as the 1940s, when people flocked outside to get a rare glimpse of a honking V formation in the sky. "I used to run out of my house to see them. Everybody did," said Don Nelson, area wildlife supervisor for the Minnesota Department of Natural Resources. Now, in a weird twist of fate, Nelson is working on a goose reduction project with the DNR. It's an awkward position to be in, no doubt, in this goose-centric city. A crowd gathered for a talk hosted by the Zumbro Valley Audubon Society earlier this month where Nelson outlined reduction possibilities, represented the great goose divide. Some people spoke up on behalf of the animals who cannot defend themselves, while others spoke out against the large number of birds. Even a bird lover like Joel Dunnette, president of the Zumbro Valley Audubon Society, felt that something needs to be done. "There is a conflict between two groups with increasing populations. We have to manage that conflict," Dunnette said, noting that either or both the bird and human populations need to make changes. The problem, however, isn't confined to Rochester. Resident geese populations have been on the rise across the country, which prompted the federal government to allow cities and states to undertake management efforts, Nelson said. But in Rochester, even simple efforts to thin the flock like removing the corn dispensers from Silver Lake Park have proven difficult. The DNR hadn't taken into account people's love affair with feeding the geese. For some families, feeding the geese at Silver Lake has been a tradition for generations. Some doctors even recommend that their patients feed and watch the geese as a form of therapy. Even so, because of the population explosion, "They may eat themselves out of house and home," Nelson said. And for a long time, the city has made sure that doesn't happen. The DNR manages the Rochester Game Refuge, part of an agreement with Manitoba, Canada, to provide secure wintering grounds and food plots for the birds. On those grounds, though, Rochester might have been too accommodating. So this summer, a $550,000 goose reduction project was started at Silver Lake. Shorelines were ripped up and tall grasses planted in an effort to make the lake a less desirable habitat for the birds. The main feeding site was also recently switched from the Gordon W. Yeager Wildlife Management Area to the corn fields at the Haverhill Wildlife Management Area about three miles away. Plus, there's also been more ice coverage since power production at the Silver Lake plant has been reduced. And while neither side may be satisfied, changes are taking place. The peak fall population estimate this year was about 23,000 geese, down from 30,000 last year. Nelson said he can't attribute the decline to any specific factors, he might be happy to see some of those highly coveted honking V formations. While Southeast Minnesota's streams and plentiful grains have always provided year-round habitat for Canada Geese, the flock in Rochester has a unique origin. • In the 1920s, Dr. Charlie Mayo started a captive flock of Canada geese at Mayowood. By the end of that decade, the captive flock numbered in the hundreds. • An area just larger than the city was designated as a wildlife refuge in 1926. The area was expanded in 1961 to encompass 42,000 acres. • The dam, which created Silver Lake, was constructed in the 1930s. • In 1948, the Silver Lake power plant was built and a Mayo Clinic patient donated a dozen captive geese to Silver Lake Park. • By the 1960s, the flock at Silver Lake had grown to 4,000-5,000 birds. Between 1970-2005, the number of birds in Rochester ballooned to between 20,000 and 40,000. • In 1962, banding studies by Harold Hanson of the Illinois Natural History Survey revealed the flock contains what was thought to be an extinct subspecies of geese, the Giant Canada Goose. • After some management efforts, this year's mid-winter population estimate -- about 7,000 -- is the lowest for Rochester since the 1950s and '60s. Copyright © 2005-2014 Love Canada Geese. All Rights Reserved.